All models enhance the TV/FM signal to overcome distribution system loss, while maintaining high signal quality. Assistance to integrate amplifier selection with distribution system design is available. Low noise (1.5 dB) amplifiers for residential and small HDTV distribution systems. Gain: 16 or 25dB for VHF Hi thru UHF band (chs 7-13, 14-51 - 174 to 700 MHz). Bandpass filtered to reject CB, FM and 750 to 1200 MHz communications signals. Our TL-EMS Series allow you to access multiple broadband antennas for Tv systems and/or Test and Measurement applications. See RF Switchers for more information. 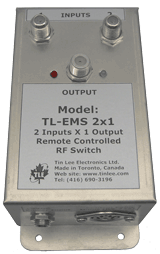 Example application: Using the TL-EMS-2x1 (see left) to switch between two antenna input signals for TV output or comparison purposes. MATV Headend modulators for audio/video sources, such as, VCR, Satellite receiver. Click for example: MATV Headend. TC-AVM is available for: chs 2 to ZZ62 - adjacent operation; and 63 to 90 CATV, 14-69 UHF - semi- adjacent operation. Custom channel-to-channel conversions. Designed to change the input frequency of a TV channel to a different output frequency TV channel. All conversions are crystal controlled, frequency stable & accurate. Signal Gain of the converter 1 to 5 dB. * Note: Most conversions are available.